Submitted by MrWannabe on Tue, 11/13/2007 - 17:01. As far as condition, the finish looks clean. There is crud around the pickup mounting and adjustment screws, the bridge adjusting screws and the micro tuning screws. The fretboard is very dried out. Obviously, if I but this, it will make it's first stop at my guitar guy for a setup and some much-needed TLC! Any help on model and possible value would be appreciated. Posted by SB on Wed, 11/14/2007 - 01:31. Sounds like a Charvel Model 1 to me. Posted by Michael on Wed, 11/14/2007 - 01:35. Good to see you back around SB. 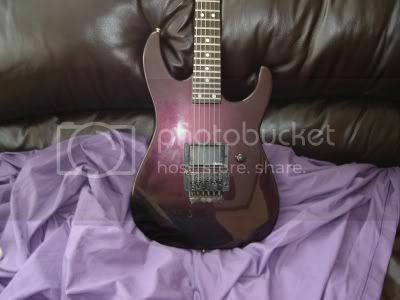 I tried indentifying a Charvel once... took me 8 hours and I still don't think we ever found out the exact model. Posted by SB on Wed, 11/14/2007 - 02:46. Thanks for the welcome back. It's about all I can do these days to keep my Forum running but I do enjoy you fellas at Guitar Site. Every time I visit you make me laugh out loud. I know your pain, but I have assembled a fairly decent collection of 1980's Charvel literature at VintAxe. I'm convinced MrWannabe has a Model 1 but he will need to dig deeper if he is interested in specifics. I am hesitant to quote prices these days since value is strongly influenced by where you happen to live in the world. In the US, the Model 1 is valued around $350-$400 but that may not be true in other regions. BTW, loved your "Ugly Guitar" competion. I plan to enter next year. Posted by MrWannabe on Wed, 11/14/2007 - 07:16. Thanks for the input. From the input on other boards and additional research on my part, I think it's a 5A. The only differences between the pic below and the git I'm looking at are the finsh and the one I'm looking at doesn't have the white marking on the pickup cover. Posted by SB on Wed, 11/14/2007 - 13:48. Yeah, the picture certainly helps. Posted by 1bassleft on Mon, 11/19/2007 - 02:34. I'll also add my delight at seeing SB again. Always a handy and unselfish source of axe-knowledge. Somewhere in your vast store of cats there must be a contender for "ugly guitar 2008". Failing that, the terrible "Tokai is coming" ad campaign.